Eddie Redmayne has emerged as a fine actor over the past few years, in films like “My Week With Marilyn” and “Les Miserables“. With his performance in “The Theory Of Everything”, he reaches a new plateau, transforming himself into the brilliant Stephen Hawking, who was diagnosed with motor-neuron disease at just 21 and was given only 2 years to live. It’s the kind of role that showoff stars leap at. Luckily for the film and us, an actor got there first. Redmayne does nothing to turn Hawking’s illness for mainstream consumption. As a result, he gives a towering performance; fierce, witty and moving. He uncovers an imprisoned character’s beating heart. What’s more, he is matched by Felicity Jones (“The Invisible Woman“), who is simply terrific as Hawking’s determined wife Jane. They meet and fall in love just before he starts experiencing the first symptoms of illness. He tries to push her away but she refuses. What happens next? You’ll have to see for yourself. But you should know that there are no missteps along the way and it’s hard to take your eyes off the screen, even during the most difficult moments. That’s because it all seems genuine and above all, touching. 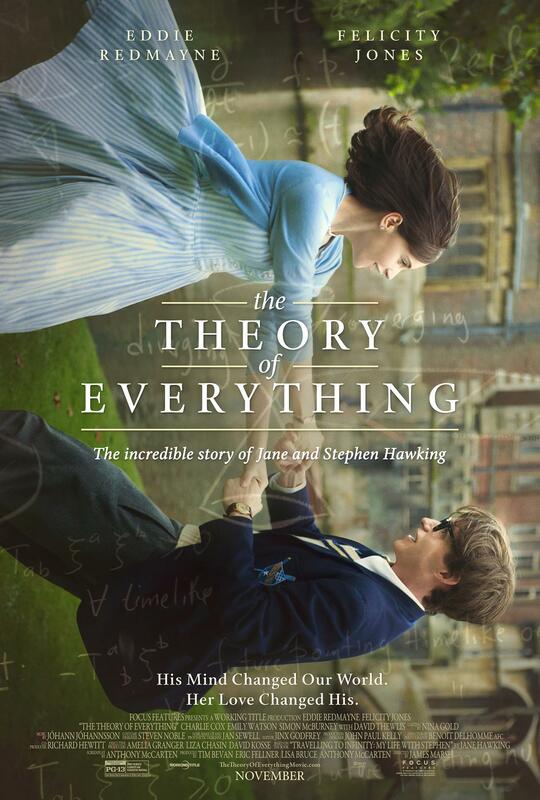 And at the heart of this uniquely compelling film is a performance that impels us to think about Stephen Hawking, not Eddie Redmayne. But when it’s over we realize what an extraordinary feat we’ve witnessed. Some actors seem to be courting award attention when they play a disabled character, and many have been rewarded for their efforts. I have a feeling that Redmayne is simply a dedicated actor whose only goal is to make us believe he IS the character he’s impersonating. Either way, I hope he gets rewarded come Oscar time. It’s a great, soulful performance. Sit back and behold.